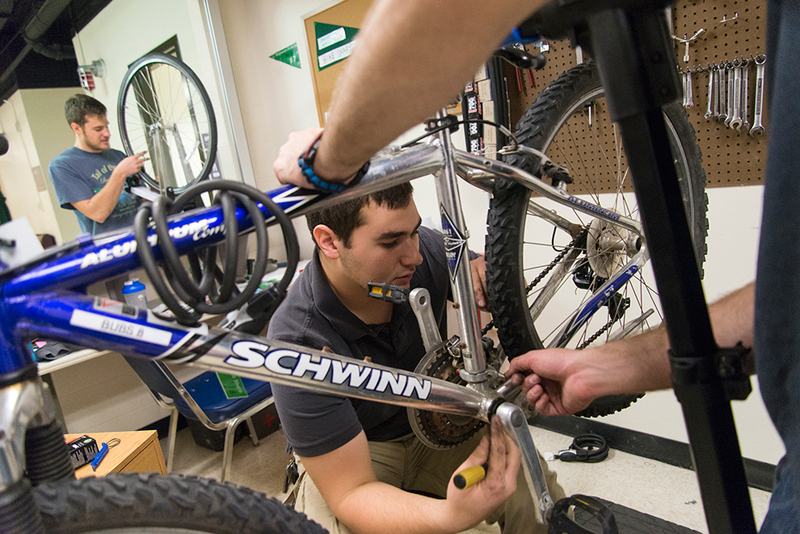 The Binghamton University Bike Shop is our brand new facility located in Room 001 in the basement of the Old Union, adjacent to the Meal Plan Office. Please come to us during our office hours (listed below) to get any Binghamton University bike-related information. If you would like help fixing your own bike, please submit a Request Repair Help form. Please bear with us as our shop develops throughout the year. Any tips or suggestions are helpful. Our mechanics have all taken a bicycle maintenance course through Outdoor Pursuits. If you are interested in taking this Bike Share-oriented 1 credit course next semester, please contact us. Class size is limited and spots are on a first-come-first-serve basis. Otherwise, just stop by our office hours and let us know you want to help out!